On Monday, 7 December, 2009, a high-profile launch ceremony was held in Mojave, California, in relation to a projected commercial space tourism flights venture under the name Virgin Galactic. 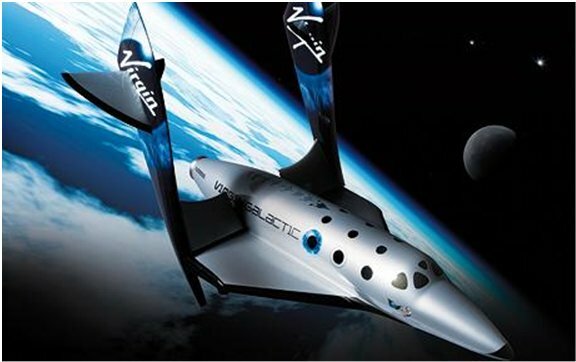 As the main focus of the proceedings Sir Richard Branson, billionaire head of the Virgin group, unveiled SpaceShipTwo - the rocket plane which he hopes will carry fare-paying passengers into space after some eighteen months of further testing and performance trials. This particular model of the revolutionary new space craft, based on the earlier and smaller X-prize winning SpaceShipOne concept, was given the name Virgin SpaceShip (VSS) Enterprise by California Governor Arnold Schwarzenegger and New Mexico Governor Bill Richardson during the proceedings. The $10,000,000 Ansari X-Prize, modeled after the Orteig Prize that Charles Lindbergh won in 1927 by flying solo across the Atlantic Ocean, was offered in 1996 to the first privately constructed manned spacecraft to exceed an altitude of 328,000 feet twice within the span of a 14 day period. The altitude of 328,000 feet converts into 62 miles or 100 kilometers above Earth's surface and represents what many consider to be the edge of space. The X-prize winning conditions were achieved in October, 2004, by the Burt Rutan designed SpaceShipOne which was crewed by a single pilot but which also carried the ballast equivalent of two passengers. In July, 2005, Richard Banson joined forces with Burt Rutan's company, Scaled Composites, with the intention of building a fleet of commercial sub-orbital spaceships and launch aircraft. The new company was intended to own the designs of a new SpaceShipTwo ( SS2 ) sub-orbital spacecraft and also new WhiteKnightTwo ( WK2 ) launch system. WhiteKnightTwo was actually finished in 2008, made its maiden flight in July of 2008, and has already undergone several months of its own trials. SpaceShipTwo is designed to have a crew of two with additional room for six passengers. 2. 90 sec.-climb to 360,000ft (110km) at a speed of 2500 miles per hour. 3. About 5 mins of weightlessness. At this altitude the curvature of the Earth is plainly visble and partakers of the Virgin Galactic space tourism flights will be able to view the Earth from suborbital space through the many portholes in SpaceShipTwo's cabin area. 4. The craft's wings fold up 90 degrees and it becomes a glider, gently coasting back down to earth. SpaceShipTwo cabin area pictured during construction. As of December, 2009, about 300 individuals were reported to have signed up for a flight and have each deposited $20,000 for their reservation. They will eventually be called upon to pay about $200,000 (£121,000) for the privilege of experiencing about five minutes of weightlessness during what will be one hundred and fifty minute end-to-end space tourism flights by SpaceShipTwo, from take off (assisted by WhiteKnightTwo), to independent landing. Also as of December, 2009, some 480 individual human beings - principally Russian, American or Chinese - had actually experienced in-space flight. 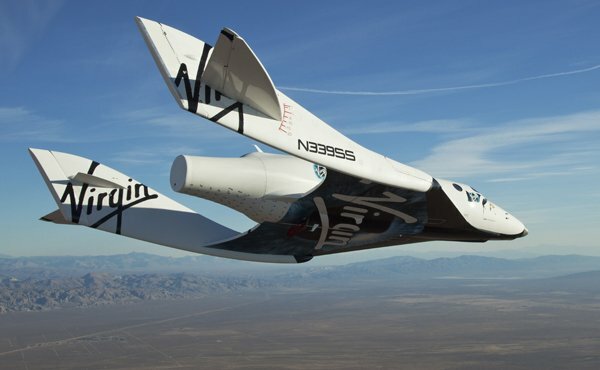 If things go to plan the $450 million (£270 million) project will eventually see five commercial vessels shuttling into space such that the Virgin Galactic SpaceShipTwo space tourism flights service offers the possibility of an additional 1,000 human beings joining this miles-high club, as fare-paying space tourists, in the first year of operations. The pair reached 45,000ft - just below the 50,000ft altitude at which SpaceShipTwo will eventually be released on a Mach 3 thrill ride to the edge of the Earth's atmosphere. Richard Branson said in a statement, "Watching VSS Enterprise fly for the first time really brings home what beautiful, ground-breaking vehicles Burt and his team have developed for us." On 10/10/10, in a further roll-out of the pre-service testing program, WhiteKnightTwo parted company with SpaceShipTwo at 45,000 feet allowing SpaceShipTwo to demonstrate its capability to independently return to earth safely in glide-flight mode. This period of independent flight saw SpaceShipTwo flying freely for 11 minutes before landing at an airport runway. "It's a very big deal," Virgin president Sir Richard Branson told The Associated Press. "There are a number of big deals on the way to getting commercial space travel becoming a reality. This was a very big step. We now know that the spaceship glides. We know it can be dropped safely from the mothership and we know it can land safely. That's three big ticks." "The next big step will be the rocket tests actually on the spacecraft itself," Branson said. "We've obviously have done thousands of rocket tests on the ground, the next big test is in the air. We'll be doing gentle rocket tests in the air, ultimately culminating into taking the spaceship into space." The project is on course for a 2012 launch date. It is anticipated that passengers will have extensive pre-flight medical checks and also undergo G-force acclimatisation. It is projected that Sir Richard, his son Sam, daughter Holly, and his mother, Eve, will be the first passengers. As of October, 2010, some 380 customers have paid down deposits totalling $50 million, according to Virgin Galactic. Notable individuals included in this list of potential space tourists include Stephen Hawking, climate change scientist James Lovelock, singer Sarah Brightman, ex-Dallas actress Victoria Principal and Paypal founder Elon Musk. The Virgin Galactic programme is hoped to be ready for launch early in 2012, and will take off from a special SpacePort being built in New Mexico to designs developed by acclaimed architects Foster and Partners. The New Mexico authorities are investing almost $200m (£121m) in this purpose-built facility in Upham. It will have a 3,000m (10,000ft) runway and a suitably space-age terminal and hangar building. Officials from Virgin Galactic and other dignitaries gathered at the spaceport on Oct. 22, 2010, for an event commemorating the finished runway. The event featured a flyover by SpaceShipTwo and WhiteKnightTwo. In relation to the Virgin Galactic enterprise itself Sir Richard Branson was careful to downplay the carbon footprint of the SpaceShipTwo space tourism flights service. Made of carbon composite, a lighter material than metal, the ship is more fuel efficient than current space vehicles, with a carbon footprint reputed to be equivalent to one business class ticket from London to New York per passenger, compared to the current Space Shuttle carbon count which is equal to the energy output of New York City for five days! Virgin Galctic considers that the technology used in their program has a relatively low environmental impact. Will Whitehorn, Virgin Galactics President stated that "we will, over a ten-year program, fly tens of thousands of people into space with less impact than one (Space) Shuttle." The mother ship, WhiteKnightTwo, is made largely of a lightweight carbon composite and powered by biobutanol and is intended to take the captive-carry SpaceShipTwo to an altitude of some 10 miles (16 Kilometers). After release SpaceShipTwo's two man crew and the craft's six passengers will be boosted into sub-orbital space fuelled by nitrous oxide and recycled nylon to experience some six minutes of weightlessness, and awesome views of Mother Earth, on each Space Tour. Virgin Galactic are not alone in seeking to become involved in Space Tourism - a Blue Origin service, relying on a rocket propelled vehicle called the New Shephard - is being developed with the backing of Amazon creator Jeff Bezos. As far as possible future developments of this technology goes. Experts say that by travelling into near-Earth orbit, the length of inter-continental flights could be cut dramatically, so a flight from London to Sydney could last just two hours. Virgin Galactic were also contemplating a lucrative commercial spin-off that could have seen orbital satellites (for telecoms etc.) being launched towards their intended orbits from high-flying WhiteKnightTwo motherships but the department charged with developing this approach seems to have been scaled back in early 2010.